Osprey Tempest 6 Reviewed - To Buy or Not in Apr 2019? Your day just freed up, and you’re going to take advantage of the warm sun and cool and get outside! You decide to take off to the closest trail for a few hours. You’ve just finished lacing up your boots and plop your water, a power bar, and an extra jacket into your giant hiking pack. What a pain that can be! With just enough space for snacks, emergency supplies, and even a light jacket, the compact Osprey Tempest 6 is breathable, lightweight and the most comfortable way to carry your hiking essentials. The smallest of the beloved Osprey Tempest Line, it will quickly become your go-to pack for brief outings and hikes. The continuous lumbar-to-hip belt wrap eliminates uncomfortable seams, while the dual bottle sleeves ensure you stay hydrated. The ideal pack for short hikes and day trips, the Tempest 6 has room for two 20 oz sports bottles (included), a good-sized primary pocket featuring dual zipper access and multiple smaller zippered pockets. Carry an extra layer with the external StraightJacket™ compression straps. 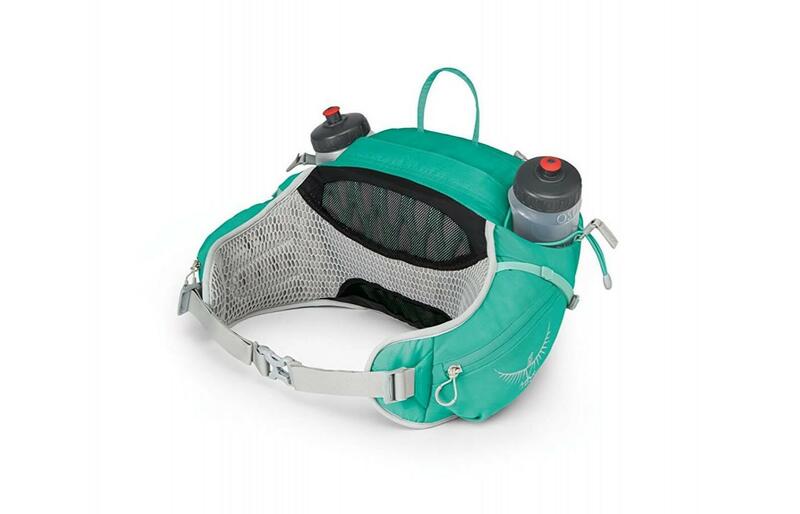 The preferred pack for multi-sport athletes, distance runners and extreme hikers, the pack sits comfortably on the hips, unlike most traditional packs which place a strain on the back and shoulder muscles for support. Reviews say the pack comfortably stores wallets, phones, snacks and even a rolled, lightweight jacket. Even customers with back discomfort reported no irritation caused by the use of this beautifully designed lumbar pack, one even reporting she forgot the pack was there!. Other customer’s said they found the pack easy to spin around for primary pocket access and simple on the go strap adjustment. The durable material and lightweight design, combined with the comfortable padding and breathable mesh lining make eliminate most post-hike complaints! The Osprey AirScape™ back panel with foam ridges for ventilation create a mesh barrier between you and the pack keeping air flowing no matter what. The padded straps and mesh hammock combine to create a lumbar designed to be comfortable both over clothing and on bare skin. While this pack is not as breathable as a lightweight minimalist option most users thought it provided more than adequate ventilation even on long hikes. The aluminum peripheral frame of the Tempest 6 shifts typical hiking pack weight from the back and shoulders to the hips for a more even, supported disbursement of weight. The mesh covered foam hip belt, and ErgoPull closure directly connected to back panel mesh creates a seamless lumbar to hip belt body wrap eliminating seam rub. Users found this back extremely comfortable with sufficient padding to support heavy loads. The pack overall dimensions are 8 x 12 x 8 inches and it weighs 2.5 pounds empty. A customer reported being delightfully surprised by the number of items they could comfortably fit into the pack, including cell phones, two water bottles, wallets, keys and even a light jacket. The small side and front pockets are perfect for important items you prefer to keep close to keys or other valuables. 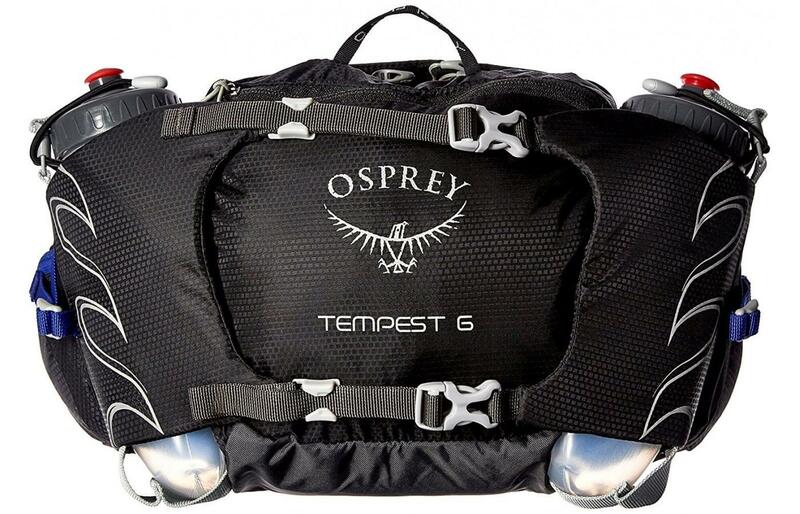 The Tempest 6 is made from the same material used in the other Tempest series packs and is backed 100% by Osprey’s quality standards. Heavyweight thread and flawless stitching reinforce the outstanding design of the pack. Though not waterproof, the thick Nylon material stands up to rough hikes and constant wear and tear from the nation's top extreme athletes. 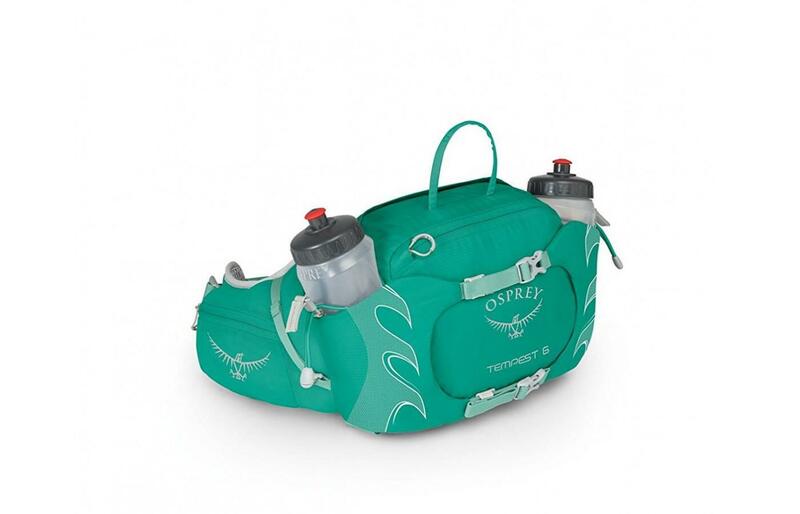 The Osprey Tempest 6 is designed to carry the essentials and comes with a safety whistle, and two 20 oz water bottles. Padded bottle sleeves with bungee retaining straps ensure your bottle, no matter the size stay in place and are protected from the elements. The stash pocket will fit small valuables while the hip belt pockets keep on-the-go necessities handy. The external StraightJacket™ compression straps allow you to carry a jacket, small blanket or an additional layer of clothing in a convenient and accessible way. If carrying consumables or electronics, we recommend that you place these items in a waterproof case before placing into the pack as the Nylon material itself is not water sealed. Marathoners, hiking enthusiasts, and most other athletes have a personal style that represents their personality and even accomplishments. Count on the Tempest 6 to not only just avoid taking away from your style, but adding to it! Perfect placement in on the lower back makes this pack easy on the eye with well-stated functionality stealing the show. Relevant and appropriate color choices and well placed contrasting accents make the Tempest 6 perfect for a wide range of tastes. Chose from Lucent Green, Iris Blue, or Black to complement your favorite hiking gear. Though the Tempest 6 is priced at the high end of the lumbar pack options available, the attention to detail, high-quality design and materials offset the cost with worry-free comfort and long-lasting durability. There are very few packs in this price range, and less still that offer the quality of material and design found in the Tempest 6. Osprey is a beloved brand for athletes, and outdoor enthusiasts and the company yet again meets and exceeds its historic standards with this Lumbar pack. If you’re looking to take a break from bulky, heavy bags breaking your back and weighing you down during your trek, the Tempest 6 is exactly what you need. This pack was designed by and for athletes and that is made evident by every feature from the aluminum, weight-dispersing frame, to the padded straps and mesh hammock. The higher price is easily offset by the care and consideration that has gone into each stitch, making this an exceptional lumbar pack at any price. Add a bit of waterproofing and a thicker front strap, and it's clear to see why so many users love the Osprey Tempest 6.